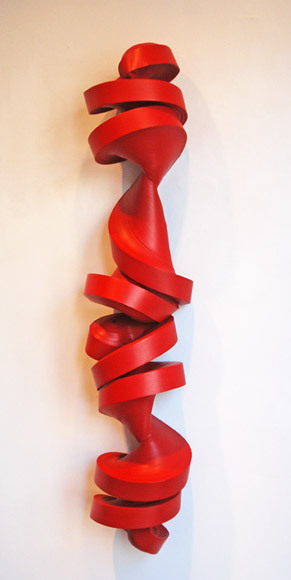 The Marsha Mateyka Gallery is pleased to present its 7th solo exhibition of sculptures by, well-known artist, Jae Ko. Her work has been the subject of solo exhibitions in Germany, Belgium and The Netherlands, as well as in museums and galleries throughout the United States. Jae Ko transforms common materials into sculpture in an alchemical tour de force. It is hard to believe that her sculptures are made of every day materials such as brown Kraft paper or, as in this exhibition, rolls of adding machine paper, which she rewinds into enormous coils. In this exhibition, the artist refines the work she began in 2006 when her focus turned to the energy trapped inside coiled paper. 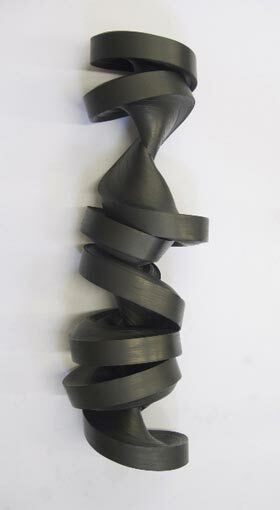 By pulling and twisting the forms and then seizing the twists with carpenter's glue, she discovered an entirely new possibility. In perfecting this technique, she now creates large-scale, strong, dynamic sculptures that from a distance appear to be carved from wood. This exhibition includes three very large works: a serpentine 13-foot long floor piece, a wall hung 7-foot horizontal piece, and 6-foot high vertical work. 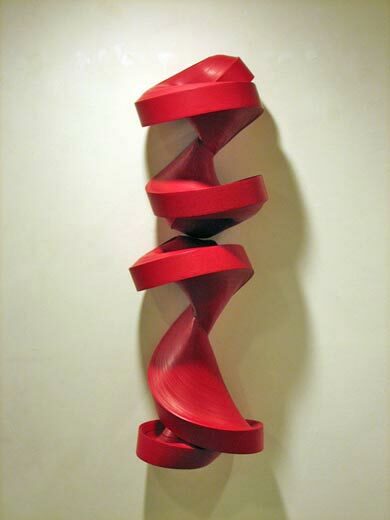 Jae Ko's sculpture exists as pure form - pure abstraction. At the same time, each refers to its source in paper and paper's origin in trees. Jae Ko's deep communion with the nature of paper and its history is also seen in her choice of color. She chooses the black of Sumi ink, a wood-based pigment, as well as the rich red also used in the tradition of Asian calligraphy. Recently Jae Ko’s work has been the subject of 3 solo museum exhibitions. 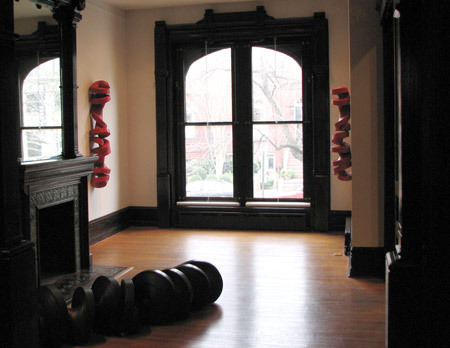 In 2008, the American University Art Museum presented a 10-year retrospective exhibition. In the fall of 2010, two concurrent solo exhibitions were on view: "Jae Ko: Paper" at the Taubman Museum of Art in Roanoke, VA and "Force of Nature", an installation, at The Phillips Collection in Washington DC. Her sculptures are in numerous private and public collections, including the Corcoran Gallery of Art and the Hirshhorn Museum and Sculpture Garden in Washington, DC. sensuous life at Marsha Mateyka Gallery"
There's an inherent tension in Jae Ko's sculpture, on view at the Marsha Mateyka Gallery in a handsome installation of nine new pieces, including three unusually large works. The most obvious tension is physical. Made from fat, ropelike coils of the artist's signature adding-machine tape that she manipulates and twists like taffy—see "The Story Behind the Work"—Ko's art has the springy energy of a snake about to strike. It's pure potential, like a muscle that has contracted in anticipation of throwing a punch. The impact is not just visual; it's visceral. There's another tension, too. Ko's latest works straddle a line between the biomorphic and the machine-made. From some angles, they don't look made so much as grown. Inspired by the gnarled trunks of bristlecone pines—which the artist encountered on a trip to California and which are said to be the oldest organisms on the planet, living thousands of years—they seem shaped by powerful, unseen forces. But they also resemble giant, misshapen augers, rejects from some Bunyanesque tool-and-die plant. One serpentine floor piece is 13 feet long. 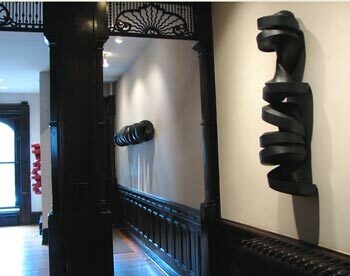 Two wall pieces---spiraling in thick ringlets—stretch more than six feet. For this show, Ko has restricted her palette. Roughly half of the works are black which underscores their cold, industrial feel. The others are covered in a bright, lipstick-red pigment, bringing them to sinuous, sensuous life. 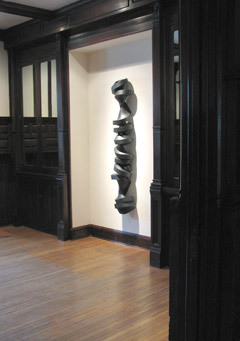 The tension between opposites lends visual interest to Ko's work, which has for several years been among the area's most formally elegant sculpture. Once known for flat, wall-mounted pieces that were all about the quiet contemplation of surface, a la Anish Kapoor, the artist's latest sculptures are a leap forward. They seem to hold an implicit threat. That makes them ever so slightly dangerous, but in a way that thrills more than chills. 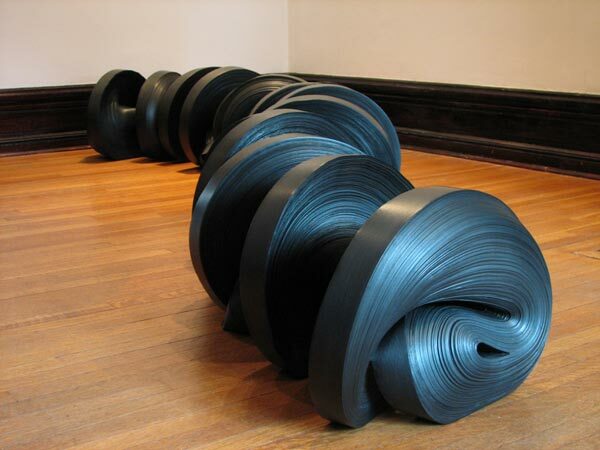 Jae Ko's chosen medium is rolled paper, in massive quantities. 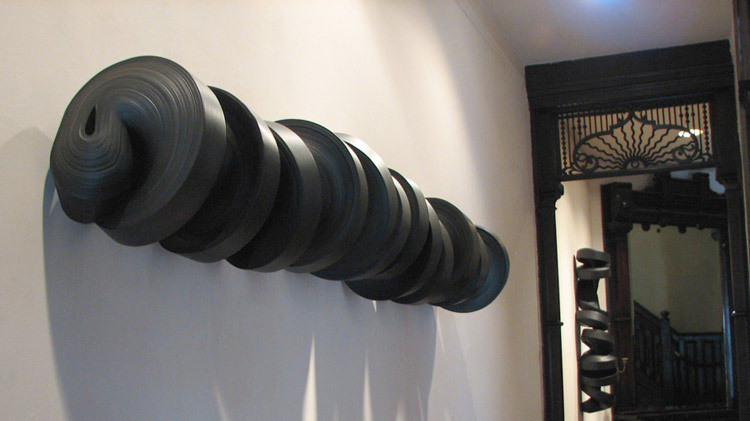 Although she sometimes works with loose rolls of brown Kraft paper—as in her recent installation at the Phillips Collection—Ko more typically uses adding-machine tape, which she painstakingly removes from the small spools it comes on and rerolls into tight, heavy coils, using a modified potter's wheel. 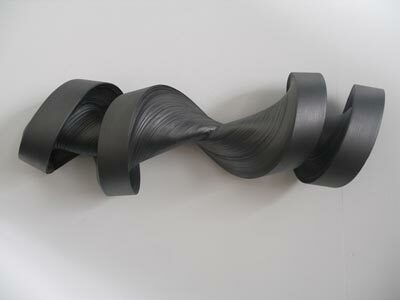 Ko then wrestles and wrenches the coils out of shape, twisting and pulling them into strange forms (in the case of her latest work, spirals). Once the sculpture looks right, she holds it in place with strong clamps, applying a mixture of wood glue and pigment that fixes it permanently. (Ko uses Japanese sumi ink for the black pigment, calligraphy ink for the red.) The dried pieces are then sanded to a matte, woodlike finish. The intensive process is a kind of strenuous, back-and-forth dance—between where Ko wants the paper to go and where it, by virtue of its own energy, wants to stay. "Jae Ko at Marsha Mateyka Gallery"
For her exhibition at Marsha Mateyka Gallery, Jae Ko doesn't deviate much from her formula. That's not a bad thing. The sculptor, one of the Washington area's most consistent, has tapped an active vein with her rolled-paper sculptures, which she treats with glue and sumi ink. The works stand on the knife's edge between sculpture and drawing, and with every return to this format, she pushes them in one direction or another. These latest works fall decidedly along the drawing end of the spectrum. 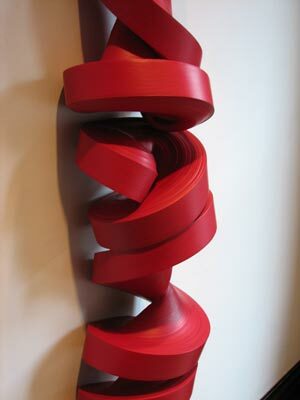 In black sumi and red calligraphy ink, these paper sculptures are elongated versions of works she has done in the past, like unwound springs; the twisting forms represent nothing so much as some sort of calligraphic script. And they look like the result of painstaking work, much as many drawings do. 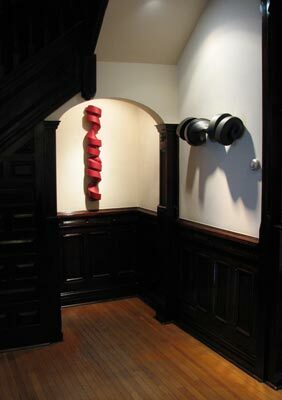 But the works are grounded in sculpture, too, with symmetries and rhythm that resist perfect regularity, just as in nature. The exhibition is on view 11 a.m. to 6 p.m. Wednesdays-Fridays and 11 a.m. to 5 p.m. Saturdays at Marsha Mateyka Gallery, 2012 R St., NW. free. marshamateykagallery.com 202 328-0088.